Here's a web edit with the United boys and some of our local riders throwin' down at the Waipio store. We're also going to do it again this Sunday at the town store at about 6:00pm. Let us know if you need directions. 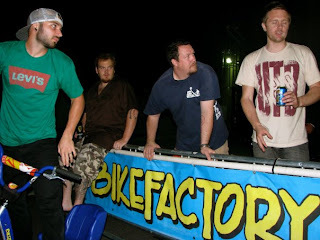 This Is United On The Road : Bike Factory Honolulu Demo from Channel 4Down on Vimeo. So, last night we had the little BBQ at BIKEFACTORY Waipio with the boys from United Bike Co. I'm pretty sure that a good time was had by all. I know I got a little loose. We even brought out Jeff's trusty old Hutch Trickstar for Ian to play around on. Age is just a number . . . that bike is over 20 years old! The boys are filming for their upcoming video "This Is United". That means we should have a bit of Hawaii in the video. Nice. I can't wait to see footage of Corey Martinez drifting the Mod! Big thanks to Azalea for taking so many great shots and sending these to me. I'm gonna hit up her site and steal some more and post them here a little later on. By the way, I know there are quite a few people out there that wanted to come out but couldn't make it to Waipio. Well, we're bringing the party to Honolulu next Sunday at 6:00pm. 740 Ala Moana Blvd. See you there! Yes, it's true. Ian and the boys from United Bike Co. are gonna be in Hawaii for some rest, relaxation and probably some filming for their upcoming video, This Is United. They'll be at BIKEFACTORY Waipio this Sunday night (January 10) from about 7:00pm. Come down to see Ian Morris, Corey Martinez, Nathan Williams, Geoff Slattery, Dean Hearne and Joe Cox session our box and the local hospitality. Bring your bikes and some potluck style dishes for the grill. BYOB if you're over 21! Let me know if you have any questions.